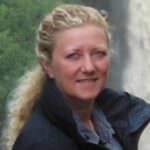 In June 2015 I was lucky enough to join the Kilimanjaro Elephant Safari in Tanzania. 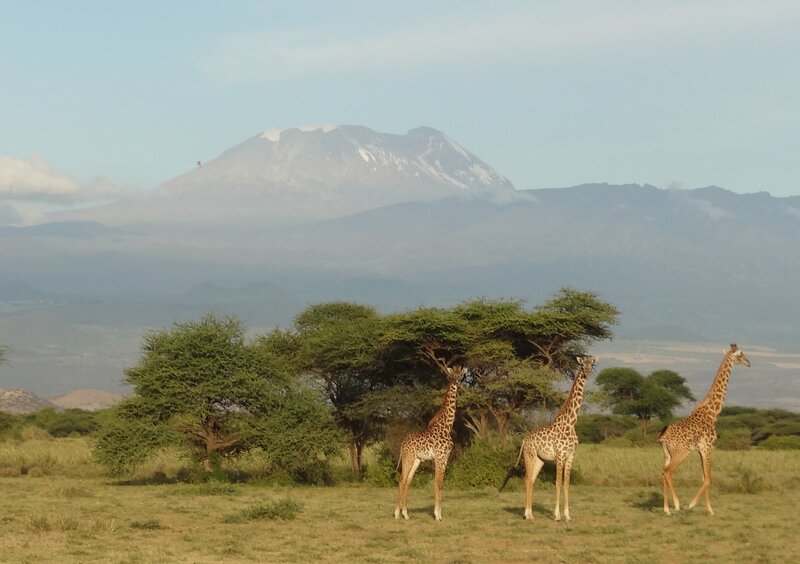 The itinerary has changed a little since then, but this is a taster of the adventures each day brought, and an insight to life on a mobile safari in Tanzania. Arrived at Kili Villa and met the other guests I will be joining on safari this week. The villa is very comfortable, and we have it privately for our group. We were joined over dinner by our guide, Jo, who went through a safety and ride briefing with us. Leaving the villa after breakfast we arrived in camp in time for lunch. The camp staff gave us a lovely welcome and showed us to our very comfortable tents. After lunch we were introduced to our horses and the tack adjusted to suit. Our introductory ride took us around the farmland in the foothills of Kilimanjaro. We met many of the local people returning to their villages for the evening, and some of them were very surprised to see people on horseback approaching them. We tried our horses’ paces and I have to say my horse, El Ganador (‘The Winner’), is a real gent, and very comfortable! I am really looking forward to the week ahead. Rising early, coffee was waiting for us in the mess tent and a cooked breakfast for those that wanted it. 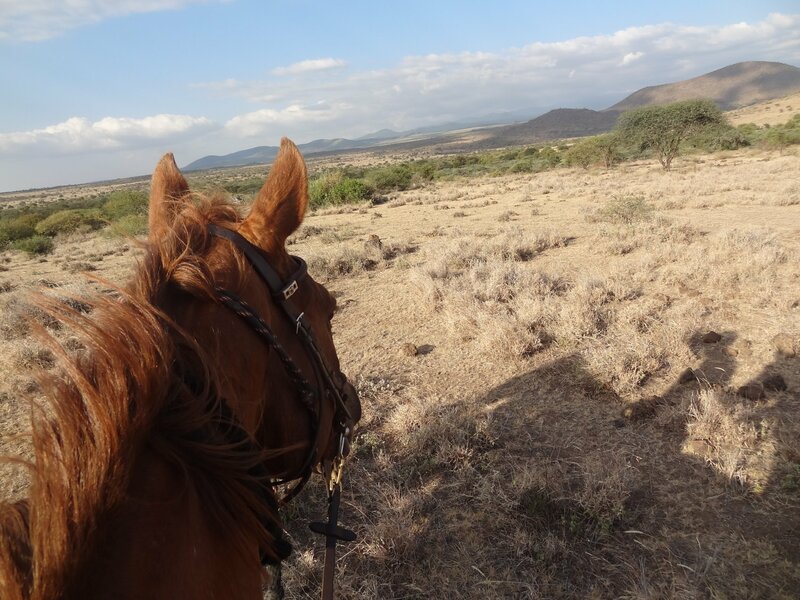 Soon we were mounted and riding away from camp through farmland to the valley below were we met Maasai herders and a family. The geology of the area changes quite quickly and we got off to walk with the horses through a particularly stony area, a lava field from eruptions hundreds of years ago. Leaving the herders behind, we crossed into the bush and immediately saw a herd of zebra, and evidence of elephants. We stopped for a short break in the shade of a tree, and I was delighted to find carrots in my saddle bags for my horse! We followed the elephants’ tracks and finally came upon a small breeding group. Circling round with the wind we were able to follow them and watch unobserved. It was incredible to see this herd of elephant so close to the grazing herds of cattle. Our trail took us over some lovely ground and we had lots of canters, our guide, Jo, letting us get used to our horses and the environment before pushing the pace a little. We saw eland and warthogs, and had a close encounter with a leopard tortoise, before arriving at our lunch spot where the table was laid in the shade of a tree and cold drinks waited for us. This afternoon was all about elephants! Firstly we came upon a small group of about eight elephants making their way to a watering hole. Excitedly we watched for a while before moving on and riding amongst a group of impala, zebra, wildebeest, eland and giraffe, with warthogs in attendance too! Then we spotted more elephants moving in front of us, and they just kept coming! There seemed to be several breeding herds travelling together, so there were lots of youngsters in the herd of over about seventy elephants. We watched them for over an hour then, as the light started to go, we had to make fast tracks to reach camp before dark. There were a few tales to tell around the campfire tonight! After a light breakfast we headed out from camp in search of elephants! We were due to move camp again tonight but Jo decided that, due to the abundance of game in the area, we would stay here for another night. We saw the elephant herd as soon as we rode out of camp, but were diverted by fresh hyena tracks. Our back up guide, Tikini, has remarkable eyes and he spotted the hyena around a kill. They moved away as we approached but didn’t go far and we were able to watch them for a long time. Leaving the hyena we rode on to find a small herd of buffalo with zebra, impala, wildebeest and eland. As we stopped for our horses’ carrot break, we were surrounded by a noisy troop of baboons; some very large males and females with tiny babies. Following good, sandy ground by the river we had some fabulous, long canters. There is no ‘follow my leader’ on this ride and the jumping of an odd log here and there is actively encouraged. Great fun! 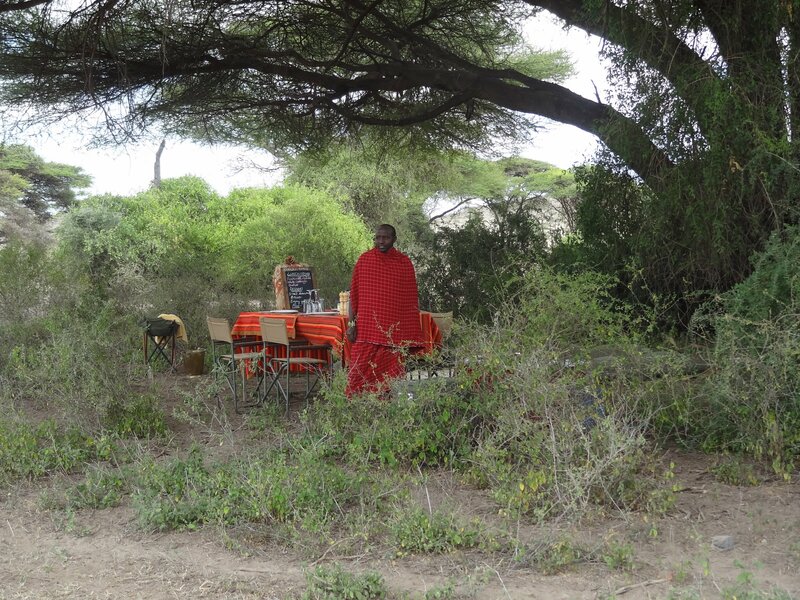 We returned to camp for lunch and then went back out in search of the elephant herd. There was a lot of evidence of where they had been, but as the bush got denser, and the light began to fade, we turned back for camp to enjoy sundowners by the fire. Today we had a long morning in the saddle as we moved to another camp. 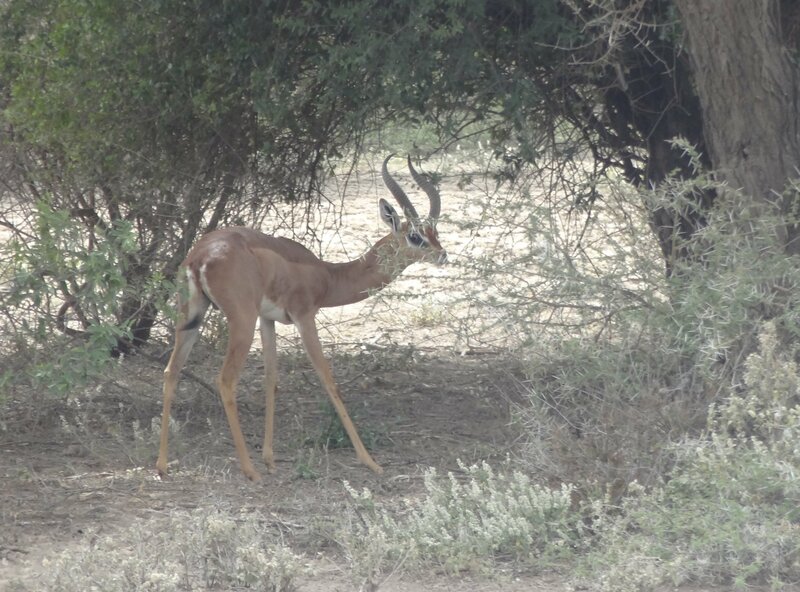 The trail moved from bush to farmland and, amongst plains game, we saw wild cat and another large herd of elephant. Stopping at Tinga Tinga village to water the horses was fascinating. This is the main watering hole in the area and so the Maasai bring their herds here, waiting their turn to take to the water. The water level was low and it was extremely muddy, so we moved on and found an alternative source for our horses. Leaving the village Jo pushed the pace and we moved quickly, jumping boma thorn fences as we went. Taking it slowly initially after lunch, we came across a large group of giraffe; magnificent against the backdrop of Kilimanjaro. The game wasn’t so abundant this afternoon, but we had fun as we picked up the pace again and rode on to our next camp. After our long day in the saddle yesterday, Jo planned a shorter morning for us. 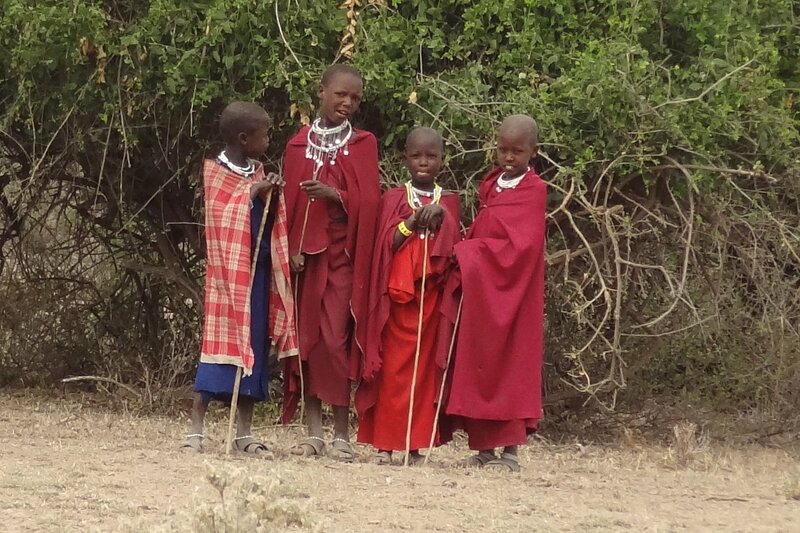 We rode out in search of the lesser kudu, which proved to be quite elusive, but passed an interesting time with a Maasai family who came out to greet us as we rode past. They were as curious about us as we were of them. 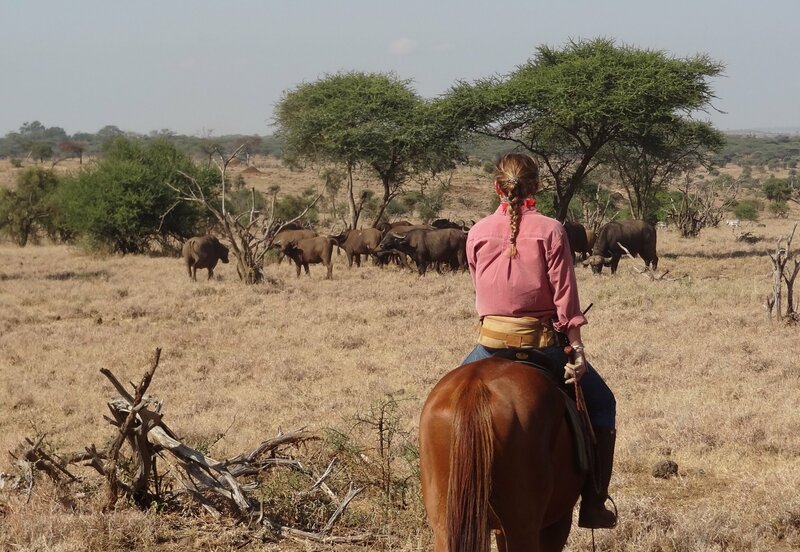 On leaving the boma we had a long canter before we crossed the ‘Seven Sisters’ hills. Slowing the pace again we were lucky enough to come across a gerenuk, also known as the ‘giraffe gazelle’, a shy animal with a long slender neck. Whilst we were at lunch we had a delightful visit from four little girls who were out tending their herd of goats. They were so shy, and took a long time to approach us, but with lots of giggles their curiosity got the better of them. After lunch we picked up the pace again for a pacey afternoon ride. There were lots of gazelle around with small herds of zebra and wildebeest. During one canter we were joined by giraffe; what a thrill! Our ride this morning took us close to Amboseli and the Kenyan border. After encountering a lone elephant, who decided to try our courage with a mock charge, we rode over the open plains with some exhilarating canters. We stopped to water the horses at a local well and were the centre of attention as our horses drank their fill. 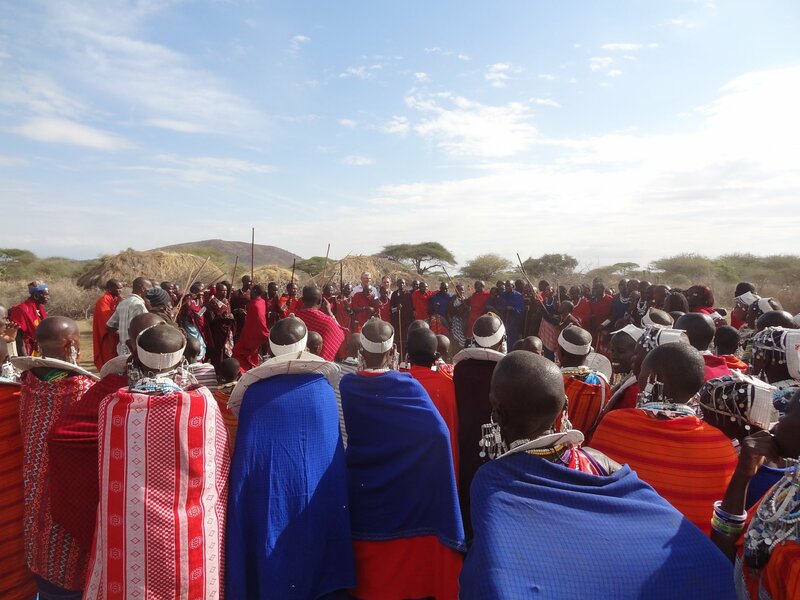 After lunch back at camp, we were invited to a local village to join a Maasai celebration. We were welcomed by one of the elders, Major, who accompanied us throughout. The singing and dancing was powerful, and the whole experience just beyond words. It was interesting to see the different age groups; the little girls who pulled my blonde, curly hair with amazement; the handsome and proud young warriors , who give protection to the village; and the elders, who just seemed to take everything in their stride! Driving back to camp after the ceremony at the village, we embarked on a bit of a night drive and were delighted to see bush babies, scrub hares, dik dik and a serval cat – fleeting, but definitely a cat! We moved camp again today for the last time. A long morning ride found us enjoying cantering on the plains with zebra, and watching the antics of frolicking gazelles and wildebeest. We explored the pans around the lake and then returned to the well to find water for our horses where we passed a herd of cattle being taken out to the grassy plain. The closeness of wild game to the domestic herds and villages is fascinating. 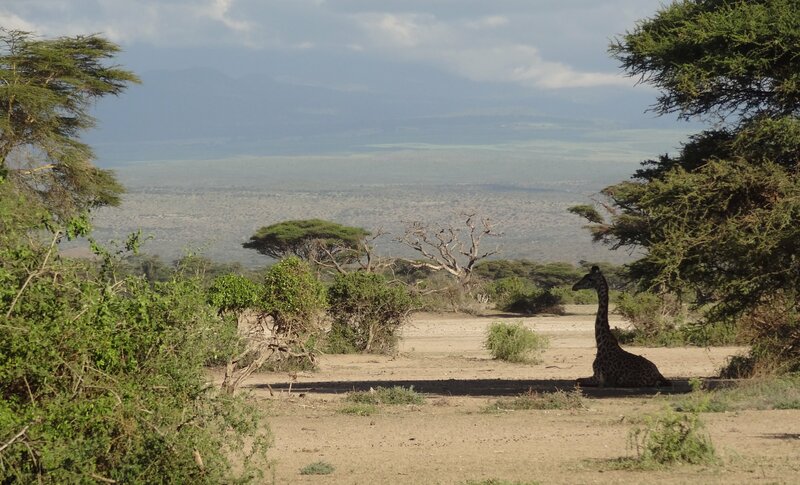 After a relaxing lunch, and just a bit of a siesta in the shade of the tree, the last ride was the opportunity to enjoy a final blast with our equine friends, and the company of giraffe as they stretched their long legs alongside us. Finally returning to camp, sundowners were on a small hill, with wonderful views stretching out in front of us. As the sun dipped, our eyes followed a lone elephant as he made his way through the bush. The last, but not least, memory from my safari in Tanzania. Just a little siesta in the shade of the tree …. 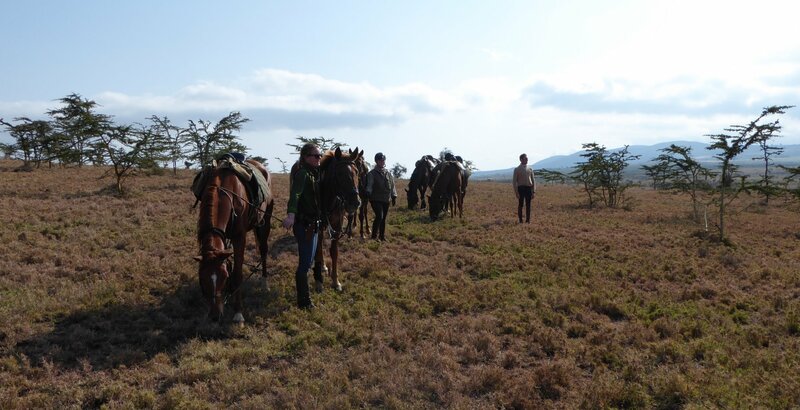 If you would like to find out more about our rides in Tanzania please contact Chris on +44 1299 272 237 or email chris@inthesaddle.com.